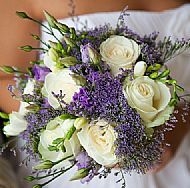 The basic fee for Marriage Ceremonies in 2019 is 450 Euros. This includes any candles, goblet, sand jar, knot rope and personalized marriage declaration used during the ceremony. An additional charge will be agreed with the clients to cover our travelling expenses, which includes travelling time, petrol and motorway tolls. We are happy to travel up to 350 kms / 3.5 hours from our base near Carcassonne. An area stretching fom Marseille to Barcelona and north to the Dordogne. Typically - our charges are between 490 and 700E. Any further than the distance stated above would also incurr the cost of an overnight stay. A portable audio system with microphones for the celebrant and readers to use during your ceremony is available and included in our fee. (Recommended for groups of over 30 guests). A deposit of 250 Euros is required at the time of booking to secure the date. Fees can also be paid in £ Sterling (exchange rate variable at time of payment). To include a Baby Naming Ceremony in or after your marriage ceremony, there would be an additional charge of 100E. Raymond Thatcher. Wedding Celebrant. Registered business in France.